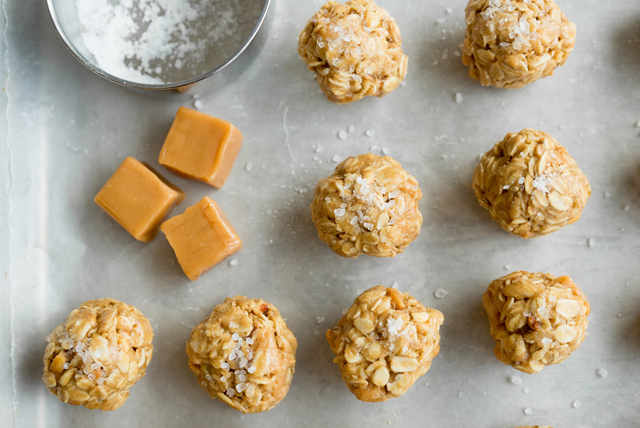 Follow these easy directions to make these Salted-Caramel Peanut Butter Snack Bites. For the perfect finishing touch, sprinkle the peanut butter balls with sea salt before serving. Mix peanut butter and honey in medium bowl until blended. Stir in oats and caramels. Roll into 20 (1-inch) balls, using about 2 Tbsp. for each. Sprinkle with salt. These easy-to-make Salted-Caramel Peanut Butter Snack Bites can be refrigerated up to 1 week before serving. Use a small scoop to portion the peanut butter mixture for each ball.